three white bowling pins are on the ground. One black bowling pin is .25 feet in front of the three white bowling pins. A small gold crown is .25 feet in the black bowling pin. A giant black bee is .5 feet in front of the black bowling pin. A tiny silver crown is .15 feet in the giant black bee. The giant black bee is facing the black bowling pin. the black bee is one foot above the ground. Three large white bees are .15 feet in front of the giant black bee. 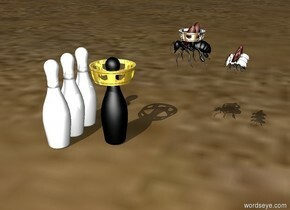 The three large white bees are facing the black bowling pin. The tiny house is on top of the enormous blue dog. huge fire is in the house. 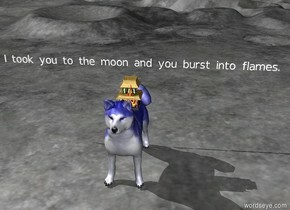 "I took you to the moon and you burst into flames." is two feet behind the dog. "I took you to the moon and you burst into flames." is fifteen feet above the ground.